Guess what? 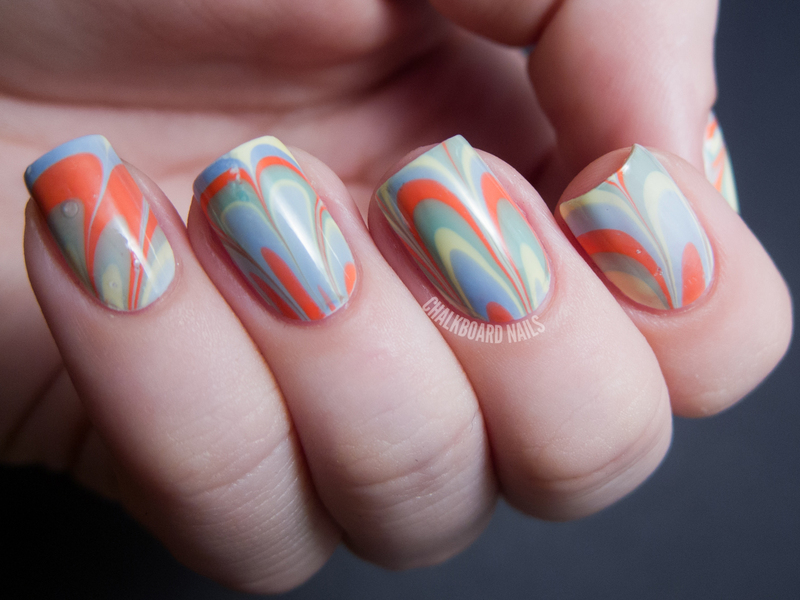 I attempted another water marble! Hooray! I think I am getting better at it, though it's still one of the hardest techniques for me to do. 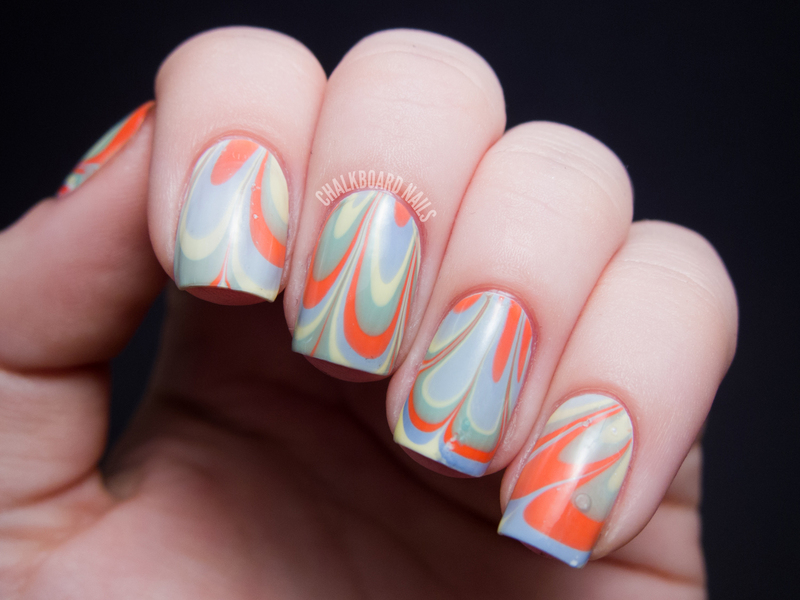 I don't understand how some of those water marbling queens do it. This marble used all four of the colors in the new LCN Blossom Sorbet Collection. Vintage Rose - This coral shade went on much more orange than I expected. Because it leans in a rosier direction, it's a nice shade for people who normally shy away from true oranges. Soft Daisy - This pale yellow shade has a bit of gold shimmer in it. Despite having high hopes for it, Soft Daisy had a pretty standard formula for a yellow, which is to say that it was a little streaky and took about three coats to reach opacity on it's own. I Love Mint - Yes, yes I do! This is a pretty standard green creme. It's a nice staple shade and rounds out the set well. Lilac Blossom - No matter how many times I see this type of color, I always love it! Pale lavenders are so pretty, and this one has a faint silvery shimmer. Besides the yellow acting like a... well, a yellow... the formulas on all of these shades were nice. I love the consistency of LCN polish! The polishes in the LCN Blossom Sorbet Collection retail for $7.50 each (8mL). They are currently available as individual polishes on LCNBoutique.com. They will also be available as a four polish box set for $24.90 -- you can preorder now and they are expected to ship at the end of February/beginning of March. Sarah... it's not even fair how talented you are... this is super awesome! Very beautiful color combo and manicure!!! I can't believe that there are any nail techniques that you are not good at lol! 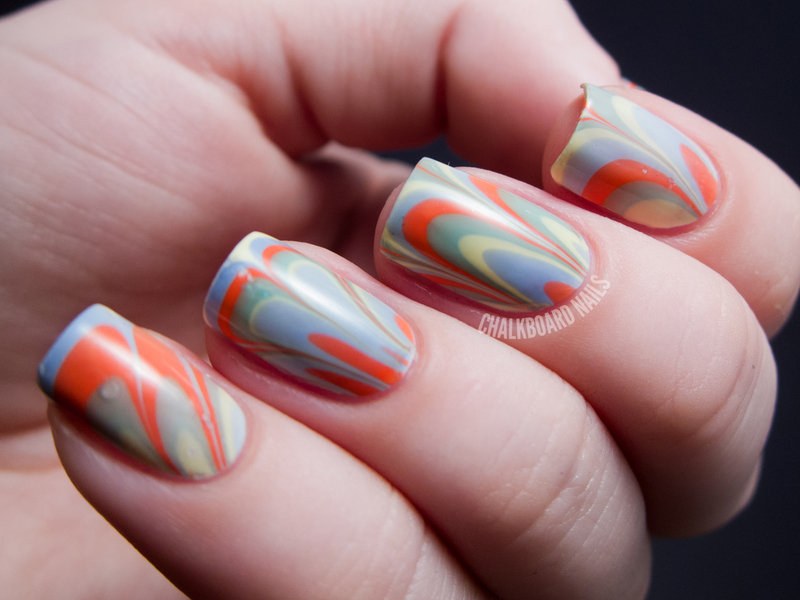 Beautiful water marble :) the technique is what got me into nail art so I am always drawn to them. Did the lavender color turn out more blue in the marble or is it my monitor? Or maybe the pictures? Your nails seem longer that they used to be, don't they? You did a great job, I love the design. Sarah- how do you do the upside-down pictures? do you take them right side up and then flip it? i've been trying to do them but they never turn out well.The first picture is the one I'm talking about. Maya, I take them as they look. I just tip my hand upside down in my lightbox and tilt my camera to match. Thank you so much! I love the pictures. Your blog is really great! 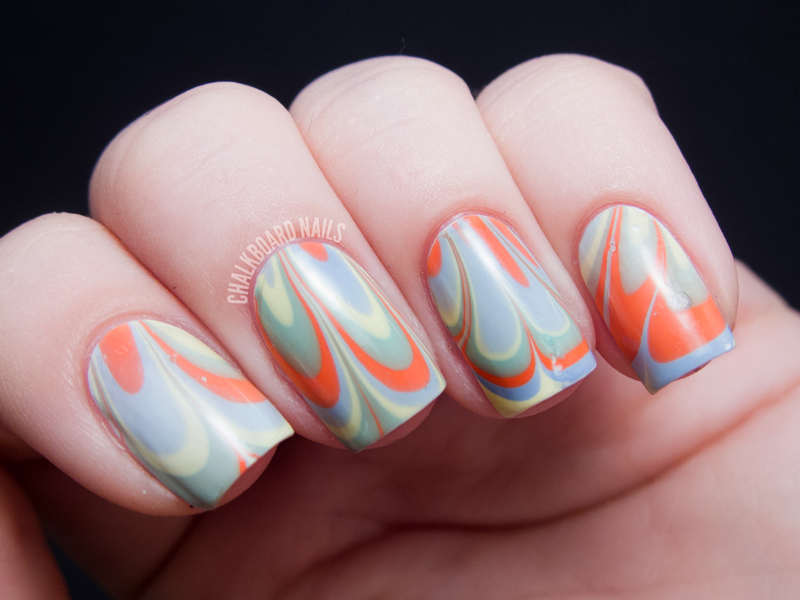 Love this marble, so pretty! Awesome! You must have had a hard time not staring at your nails all day! !